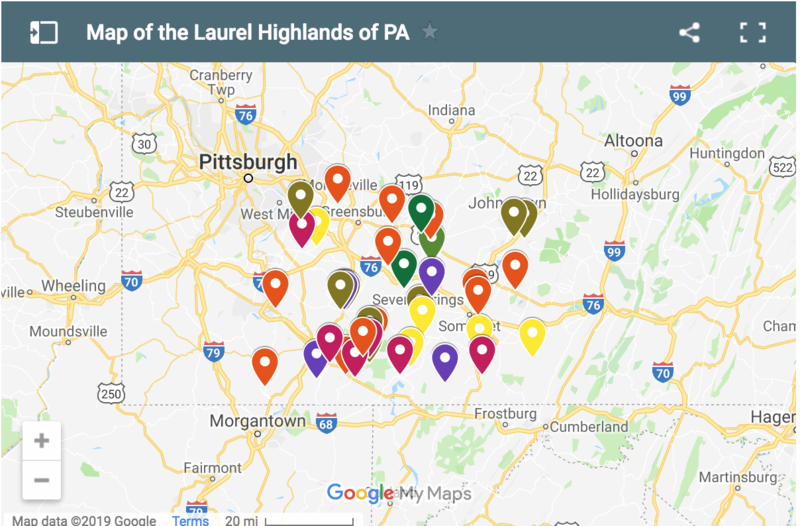 When it comes to outdoor destinations in the Laurel Highlands, Ohiopyle State Park tends to get all the love. 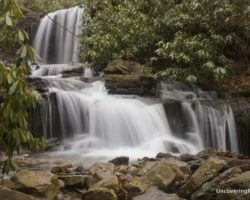 Of course, that’s because Ohiopyle is amazing! 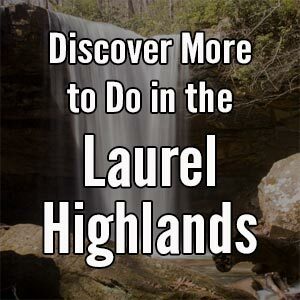 However, that doesn’t mean there aren’t other great outdoor things to do in the area. One such example is the nearby city of Connellsville. 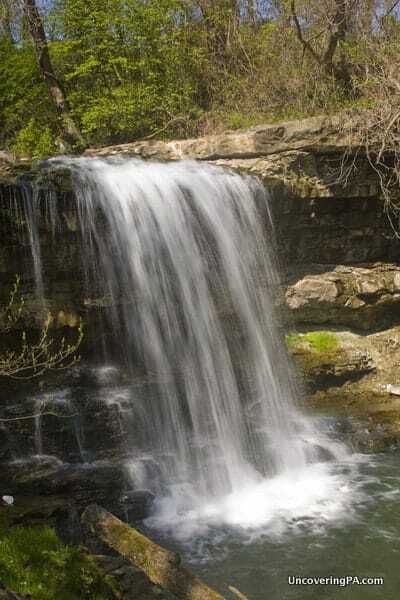 In addition to being a stop on the Great Allegheny Passage, Connellsville is home to several great waterfalls. 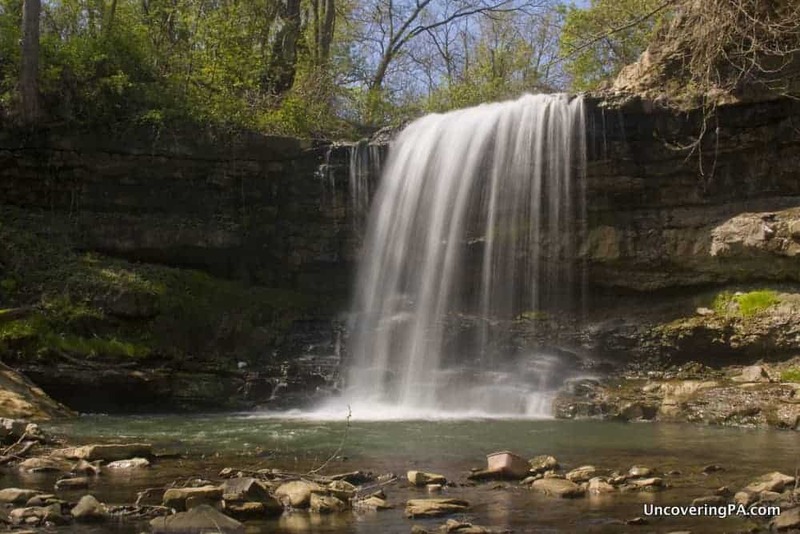 Of these, the most impressive is Robinson Falls (Don’t miss the easily-accessible waterfalls of East Park while in the area). 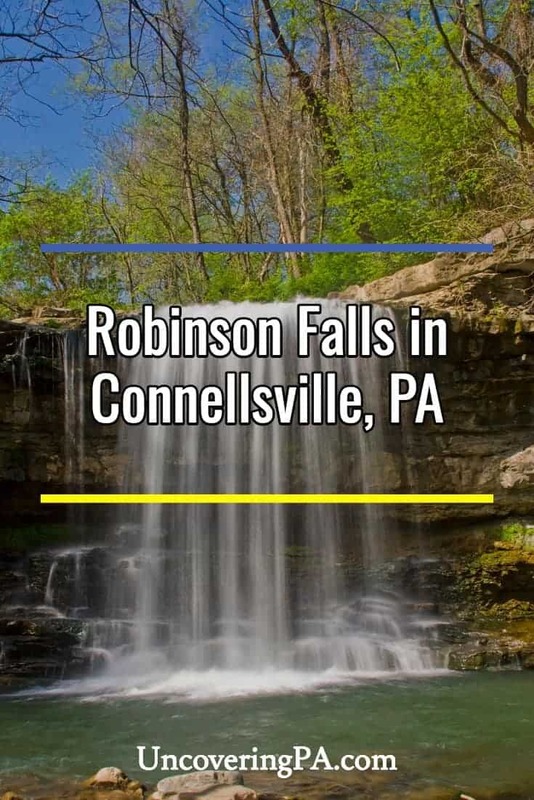 Located along Opossum Run on the outskirts of the city, roughly a half-mile upstream of the Youghiogheny River, Robinson Falls in Connellsville, PA is an impressive plunge waterfall that is located right next to a small road. While it is possible to see the waterfall from above, it’s hard to get a good look at it due to the area’s thick vegetation. Getting to the bottom of Robinson Falls is difficult, but worth it. Robinson Falls plunges roughly 20 feet into a shallow pool below. The top of the waterfall is located very near to the bridge for the appropriately named Falls Avenue. The history of this waterfall is actually quite interesting. 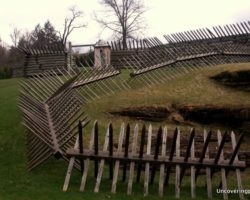 It is located along a former Catawba Indian Warpath that once ran from New York to North Carolina. 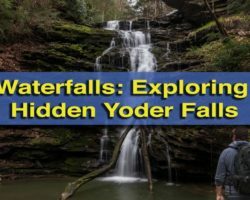 During the French and Indian War, General Edward Braddock led his 1,500 troops, including George Washington, along this warpath, and may have camped around this waterfall. 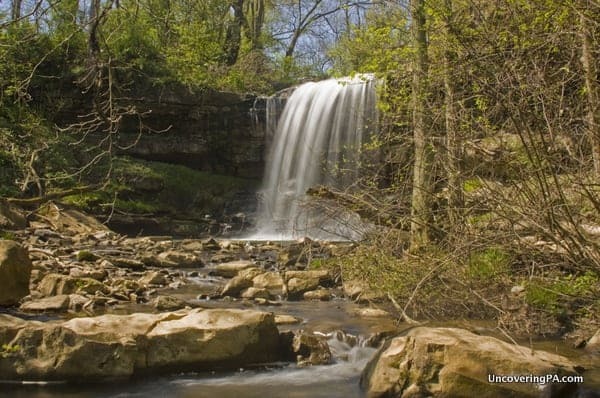 Robinson Falls is also the site of the first geological description of any location in Pennsylvania. According to an 1876 publication, Thomas Hutchins gave a short geological description of the waterfall to the American Philosophical Society in Philadelphia on January 28, 1786. Between his very detailed description and the lack of change in the area, there is no doubt that Hutchins was describing the waterfall. Robinson Falls as seen from about halfway down the hill. 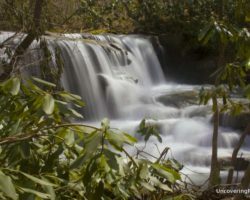 The waterfall was later named Robinson Falls after James Robinson, who operated a mill and distillery in the area in the early 19th century. Getting down to the bottom of this waterfall is very difficult, and requires a very steep descent over rocks and a fallen tree trunk. Only the most surefooted visitors should attempt to go down this hill. However, many visitors should be able to make it down the hill a bit to get a better view of the waterfall. As always, make sure to know your limits. 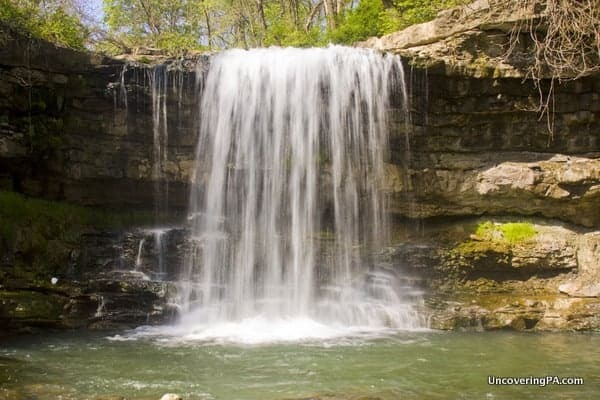 From the bottom, you can get a great feel for the beauty and power of Robinson Falls. Even though it’s close to the city, it feels like you’re far away from civilization, with only the sound of the waterfall interrupting the silence. Robinson Falls as seen from a bit further downstream on Opossum Run. Robinson Falls is truly a hidden gem. 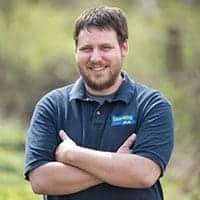 While it’s not difficult to find, it can be difficult to get a good view of, so I can only recommend it to those comfortable with descending steep, slippery, and obstacle-filled hillsides. Robinson Falls is located on the western banks of the Youghiogheny River, just outside of the Connellsville city limits in Pennsylvania’s Laurel Highlands. It is located at the following coordinates: 40.017897, -79.610758. There is room for a couple of cars to pull off at the corner of Falls Avenue and Independence Avenue. From here, cross Falls Avenue and look for the narrow, unmarked trail down to the bottom of the waterfall. 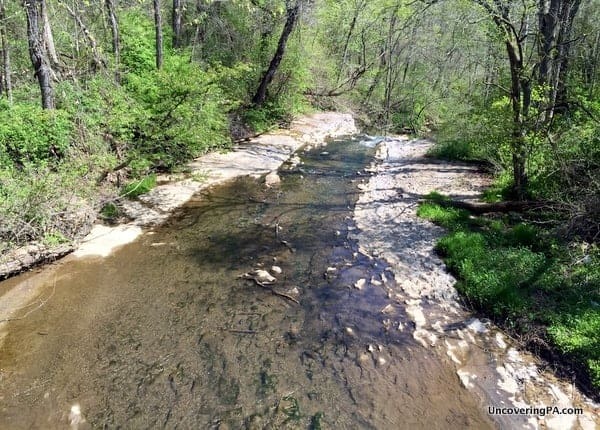 Opossum Run as seen from the bridge on Falls Ave. The top of Robinson Falls can be seen in the distance. Those not wanting or unable to go all the way down to the bottom can get a decent view of the waterfall by venturing about a third of the way down the hill. Unless it is especially wet or icy, getting down this far shouldn’t be too difficult, but always exercise caution. It’s also worth noting that I am unsure of the ownership status of the waterfall. It does appear that Robinson Falls is on private property, but there are no signs indicating that you aren’t allowed to trespass. Do your part to keep the area clean and safe so that there is no reason for the property owner to limit access. Please make sure to obey any private property signs that you might see in the future.